Carson CP-60 MagniVisor Deluxe Is A Lighted Head Worn Magnifying Visor With LED Light And 4 Different Lenses 1x, 1.5x, 2x and 2.5x. 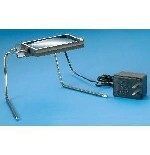 Coil 5844 Fleximag Stand Magnifier. 1.7X Magnification, Spherical Lens, Flexible Base.